Growing salmon need small creek mouths in Lake Washington for rearing habitat as they make their way out to Puget Sound. But many historic creeks have vanished or been directed to drainage pipes. In 2014, the City of Seattle re-established 440 feet of stream channel through Beer Sheva Park to reconnect Mapes Creek to Lake Washington (pdf) —one of a series of shoreline "rest stops" Seattle is recreating for juvenile salmon. The first year of post-project monitoring shows that juvenile Chinook salmon, other salmonids, and other native fishes are already using the creek. In addition to on-the-ground habitat projects, the WRIA 8 Salmon Conservation Plan also calls for actions related to land use, education and outreach (sometimes called "programmatic" actions). In our highly urban—and rapidly growing—watershed, how we manage our growth, and whether we can inspire watershed residents to protect salmon, are key factors in salmon recovery. Encouraging soft shoreline techniques and protecting shoreline vegetation for lakeshore properties, primarily through regulation. As the watershed changes and population grows, WRIA 8 partners need to continue rigorous implementation of these programs, and find ways to better assess their effectiveness. Through partnerships with non-profits, local governments enhance their capacity to restore habitat and engage citizen volunteers. 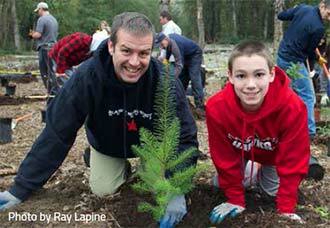 For example, Mountains to Sound Greenway Trust turned out hundreds of people to plant native trees and shrubs along Issaquah Creek in late 2015 at the City of Issaquah's Confluence Park restoration project (pdf). Issaquah and Mountains to Sound also partner to provide ongoing stewardship of city-implemented restoration projects. Nearly all non-profit partners who responded to the survey have active volunteer programs involving citizens in restoration, stewardship and/or monitoring. Another area of strength for our watershed non-profits is education about salmon conservation to K–12 audiences, elected officials and other stakeholders. Both volunteer stewardship and educational programs are top priorities for these groups and they report high levels of effectiveness. WRIA 8 partners work collaboratively on the Plan's programmatic actions. The City of Redmond, King County, Puget Sound Partnership, Department of Ecology and others are working with the Washington State Department of Commerce on an EPA–funded project called Building Cities in the Rain to find approaches to manage stormwater and protect/restore priority habitat in urban areas. Project partners aim to keep development economically feasible in densely populated areas, thus reducing sprawl and protecting air and water quality, while still meeting stormwater management goals to recover the health of aquatic ecosystems. With WRIA 8's increased focus on the importance of streamside forest cover to salmon, non-profits have also partnered with local governments to control invasive species and plant native trees and shrubs. Local governments sometimes lack staff for this work, which typically crosses jurisdictional boundaries. People are more likely to protect salmon and habitat when they feel connected to the resource. For nearly a decade, WRIA 8 has helped thousands of people witness salmon return to local streams and rivers each fall. This "in-person" experience is supported at sites around the watershed through the Salmon SEEson program, which in recent years has expanded to include more than a dozen sites. Several jurisdictions and non-profit partners collaborate to identify sites, some of which have trained interpreters available; others are self-guided. WRIA 8 has also supported the Cedar River Salmon Journey, Beach Naturalists, and Salmon Watchers programs to raise awareness of salmon and habitat restoration in our watershed. These programs train volunteers about the watershed's natural resources, who in turn teach and engage others. A tremendous amount of work has been done to recover Chinook salmon in WRIA 8 in the last 10 years through education and outreach, regulating land use and protecting and restoring salmon habitat. An important part of our recovery effort is assessing whether our actions are working as intended and if there is new information we should consider to help adjust our strategies.